Jubilant Sri Lanka captain Dinesh Chandimal praised solidarity and teamwork of his teammates which earned them the much needed series victory in Bangladesh during a press briefing at the Sri Lanka Cricket headquarters following their arrival yesterday. “We were not just like a team there, we were a family and that unity gave us the winning rhythm. I really appreciate the support given by the SLC president during the recent turbulent times. When everything was going wrong for us, he stood by the team and gave us the morale support to recover,” said Chandimal at a press conference. “Our coach Chandika Hathurusingha brought a big difference to the team and the supporting staff has done a great job to get the team on a winning streak. It is great to earn a series win at the beginning of the year,” he said. Chandimal also revealed that the first two defeats in the Tri Nation Series greatly helped them to re-unite and build teamwork. Man of the Series and Man of the Final in the T20 series Kusal Mendis said that he was highly satisfied with his performance and thanked his teammates and coach for all the support and encouragement. “I think we played as a team and that is very important. I have to improve my batting while maintaining consistency,” he said. SLC president Thilanga Sumathipala said that he is very happy to see Sri Lankans enjoying a series win, ending a long victory drought. “We knew that we will bounce back, but it took some time. 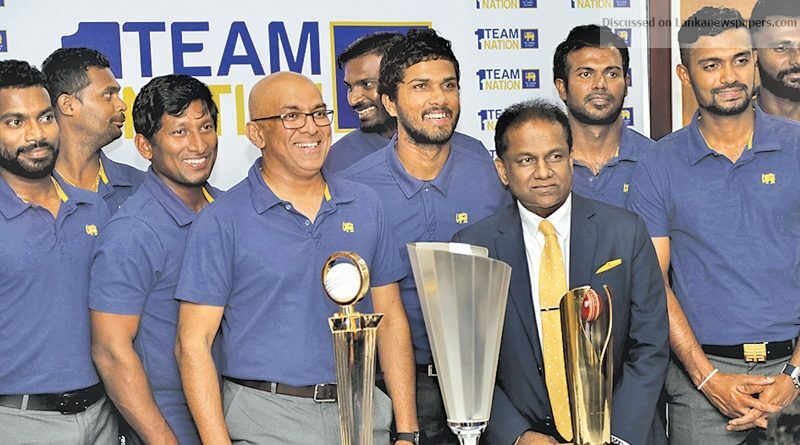 Head coach Hathurusingha, batting coach Thilan Samaraweera and bowling coach Rumesh Ratnayake have done a tremendous job to get the best out of the individuals while building the winning mentality in them,” the SLC president said. Sumathipala also went on to say that Sri Lanka has a unique brand of cricket which they were unable to maintain in recent times, but this victory indicates that they are regaining that lost glory and will pave a platform to develop the Sri Lankan brand of cricket once again. Sumathipala also acknowledged Chandimal’s improvement as a captain in both Test and T20 formats. “Chandimal showed good temperament as a Test captain in Pakistan and now he has proven his T20 leadership which is a good omen for Sri Lankan cricket,” he further said. Head coach Chandika Hathurusingha said climatic and environmental conditions in Bangladesh too helped the Lankans to perform well. “We built a better communication among players and I personally do not believe my experience as the Bangladesh coach was not the main factor for victory. It is the players who earned it,” said Hathurusingha. When asked that this victory will be an assurance for the same T20 team to be retained for the upcoming Nidahas Trophy tri-series against India and Bangladesh, Hathurusingha replied that there is no such assurance in the sport of cricket and the squad will always be picked according to the opposition side and pitch conditions. He also mentioned that players like Kusal Perera and others who performed well in the past too have the opportunity to enter the Nidahas Trophy squad with improved performances. Injured captain Angelo Mathews revealed that he might be able to play again very soon and commended world record holder Rangana Herath (highest left-arm wicket-taking bowler in Test cricket) for his long time contribution to Sri Lankan cricket. “I feel great to share the series win as a spectator and hopefully will be able to savour many wins as a player in future,” he said.